That Stack of Books listeners, I am back with an interview with none other than Nancy Pearl. 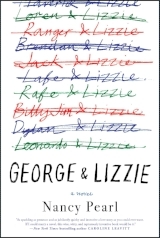 Nancy has written her first novel, "George and Lizzie." It's a love story, with one partner, Lizzie, trying to figure out just how committed she is to George, who seems to be going along with a heart full of love and a head full of patience. We met in Seattle at the Bryant Corner Cafe, our ongoing book club haunt, to talk about her foray into fiction.